These three exercises test the application of fire from two or more guns against linear, deep, linear with depth, and area targets. They test collective individual skills, fire control, leader skills, adjustment of fire, methods of target engagement, and the control of one or more fire units. Tables I-5 through I-7 should be used with unit LFXs. They can be held on any range or piece of terrain that supports the MK 19. Targets may be made up of 55-gallon drums, hulks of old vehicles, silhouettes, chalk, panel markers, or engineer tape. 1. Engage a linear target with a pair of MK 19s (two guns). Given a linear target 100 meters wide from 800 to 1,200 meters, two MK 19s on tripods with T&E mechanisms, during the hours of daylight or under degraded conditions. 1. The leader lays the guns on his respective flanks. 2. The leader issues the fire command for engaging a linear target. 3. Gunners engage using traversing fire. 4. Observers ensure that fires remain on the target and adjust appropriately. 2. 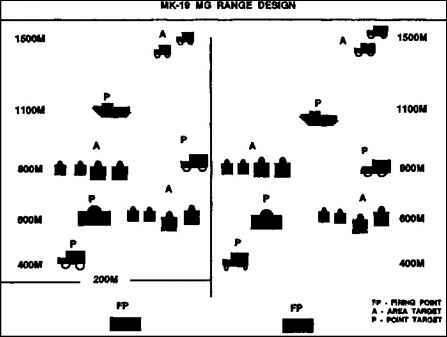 Engage a linear target with two pairs of MK 19s (four guns). to 1,200 meters, four MK 19s on tripods with T&E mechanisms, during the hours of daylight or under degraded conditions. Same as Task 1, except the leader may have to subdivide the target.